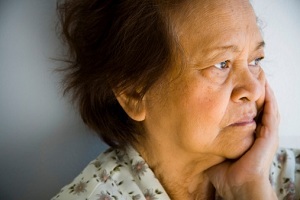 Dementia, a generalized and chronic loss of brain functioning, is not a disease in itself. Rather, the condition can be described as a variety of symptoms that are linked to a decline in memory and other cognitive functions. Dementia is often attributed to age, but this association can be misleading. A number of illnesses can lead to dementia, and the symptoms may appear at any age. Dementia that occurs with conditions such as vitamin deficiencies and thyroid issues can sometimes be reversed when the conditions are treated, but dementia, when it occurs with conditions such as Alzheimer’s disease, is permanent. Many adults may experience slight mental decline as they age, but the belief that dementia, or a severe decline in cognitive function, occurs inevitably as one grows older, is incorrect. The primary risk factor for dementia is age, but researchers believe that regular physical exercise, heart-healthy diets, and low cardiovascular risk factors may potentially help decrease one’s likelihood of developing dementia. The chapter from the fourth edition of the Diagnostic and Statistical Manual, “Delirium, Dementia, Amnestic, and Other Cognitive Disorders,” has been updated in the DSM-5 to “Neurocognitive Disorders.” The fifth edition also replaced the term “dementia” with “major or minor neurocognitive disorder,” as the word dementia was considered to have some effect on the stigmatization of aging adults. Dementia can affect any and all areas of cognitive functioning. Symptoms vary both by individual and depending on what has caused the dementia. There is no specific test to determine whether dementia is present. The condition is generally diagnosed based on one’s medical history, presenting symptoms, and changes in function and behavior. An individual may be said to have dementia when there is significant impairment to at least two core cognitive functions. Changes in behavior, such as altered mood, increased aggression, or depression. Difficulty remembering things. Either short-term or long-term memory may be affected, although short-term memory is typically affected first. Trouble with math, language, reading, the processing of information, or other cognitive skills. Though cognitive impairment does not always lead to severe dementia, people with dementia will generally experience ongoing cognitive deterioration. When brain cells are damaged in such a way that they become unable to communicate with each other normally, dementia may be the result. Damage to brain cells as a result of Alzheimer’s disease is the most common cause of dementia, while vascular dementia, or dementia resulting from a stroke, is the next most common cause. In most cases, the brain changes that lead to dementia are non-reversible. However, prognosis and treatment may vary with the cause. Dementia cannot yet be cured, and there is no treatment available to slow or stop progression. However, some drug treatments may improve an individual’s symptoms temporarily. When dementia is irreversible, treatment may focus on teaching coping strategies to those with dementia, and helping family members provide assistance. Mental health treatment, medication, rehabilitative therapy, and assisted living may all help with treatment. People diagnosed with dementia may wish to ask their doctors about the specific cause of their dementia, since treatment methods can vary significantly. When dementia occurs as a result of the side effects of medication, substance abuse, or other reversible factors, treatment is most likely to be effective with early diagnosis and treatment. National Institute of Neurological Disorders and Stroke. The Dementias: Hope through Research. Bethesda, MD: BRAIN. 2013.